Martin Maruskin blog (something about SAP): BPC add-in error: "wrong CSV Format"
BPC add-in error: "wrong CSV Format"
Below error is pretty appearing quiet often while working with EPM add-in in MS Office. It is actually also tricky error as there may be a many things to consider that may cause this error. Below I introduce few things that needs to be checked as they may have a root cause on this error. Solution: as per SAP Note 1709380, hierarchy first needs to be deleted, dimension processed, data added back to hierarchy and finally dimension to be processed again. If this does not help proceed with running of ABAP reports UJXO_CLEAN_DIM_CACHE and UJXO_CLEAN_TDH_DIM_CACHE according notes 2229878 and 2201768. Also, report UJA_REFRESH_DIM_CACHE needs to run for involved dimension as per Note 2269291. If this is specific to TDH dimension see Notes 2767117 and 2303454. It is caused by transport and according SAP Note 2085650 BPC dimension needs to be retransported. 3. Loading of data from flat files. 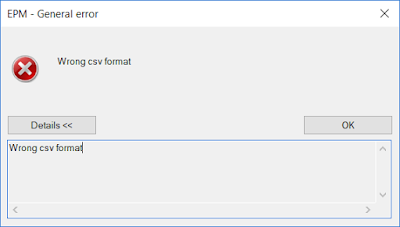 See SAP Note 2411607 - "Wrong CSV Format" error or missing members in EPM client. 4. Inconsistency caused by /CPMB/A9* objects under 'unassigned nodes'. Proceed accordign Note 1927742. 5. Restore environment related issues. See Note 2162971 how to use report UJXO_CLEAN_DIM_CACHE to fix it.